Over 300 cadets took part in the National Bands Concentration at Longmoor 21-28 Oct. Cadets took part in APC (Army Proficiency Certificate) Music Star training from Beginner to 4 Star, with specialist courses for bands, Corps of Drums and Rifles Bugle Platoons. During the week, the 4 Star Bandmaster/Drum Major course organised a Retreat Parade and concert at the Shannon Court Residential Home, which was very well received by the elderly residents. This event also formed part of the BTEC (Music) course and CVQO (Cadet Vocational Qualifications Organisation) were present for two days to assist cadets, who are taking this qualification. 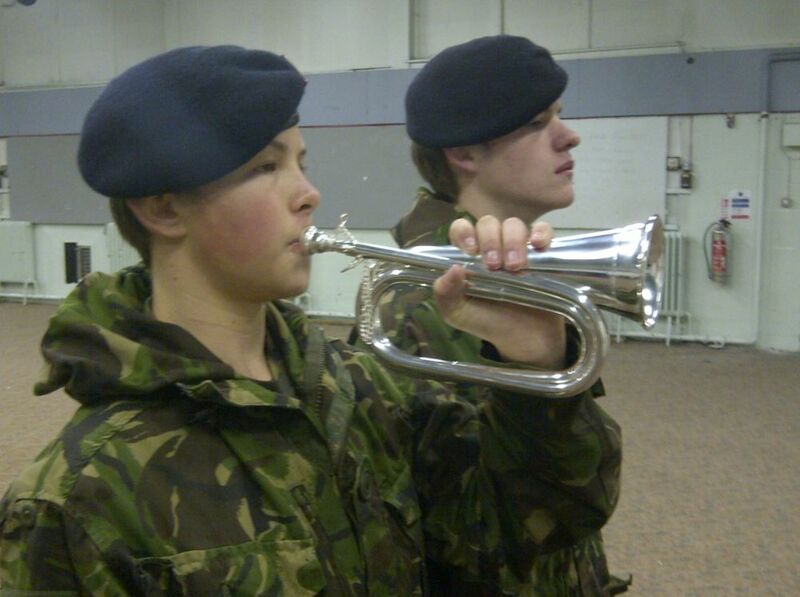 Visitors were pleased to see senior cadets not only playing excellent music, but also learning to teach junior cadets. The cadets also took part in a shooting competition, first aid training, sports and swimming. At the “Tex Factor” contemporary music competition, Lance Corporal Karly Peat of Staffordshire, claimed first prize with her excellent guitar playing and singing. Major Tex Calton, ACF's National Music Adviser was, of course, the compere at this fun event. On the prize giving parade held on Sat 27 Oct, Lord Lingfield, the inspecting Officer praised the standard of music and drill. The prize winners came from all parts of the country – reflecting the national nature of the event. Lance Corporal Paige Cranham from Clwyd and Gwynedd ACF was awarded the ACF Senior Drum Major sash for the next six months and the Best Four Star in the Corps of Drums was Cadet Lance Corporal Hurst of Cleveland ACF. The Four Star Band award went to Cadet Lance Corporal Rebecca Robinson of Hants & Isle of Wight ACF and Cadet Hesham Esmat-Abdelhamid of Berkshire ACF was awarded the best overall band cadet prize. Later that evening the camp culminated with a concert at the Turner Sims Theatre in Southampton under the guidance of Captain Steve Croney, Hants & Isle of Wight ACF Band and Drums. The audience enjoyed an excellent selection of military and popular music played by the band, with the Corps of Drums joining in the “Poppy Day” finale. The next national music concentration is at Altcar Camp, Merseyside 30 Mar – 5 Apr.